A rapier is a long, straight-bladed cut-and-thrust single-handed sword optimized for the thrust and featuring a guard that affords good protection to the hand; the rapier sees its apogee between the last third of the Sixteenth Century and the end of the Seventeenth. 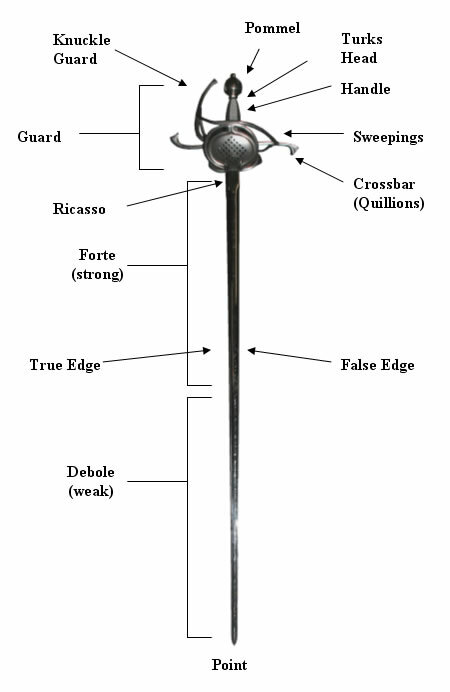 The rapier anatomy of the rapier is broken into two distinct parts: The blade, and the guard. The blade of the rapier describes the long sharpened piece of metal which all the other parts surround or attach. At the base of the rapier blade is the tang, which is a long tongue of metal that descends into the guard and ends at the pommel which is screwed onto threading or attached more permanently through [peening] or welding. The unsharpened section of the blade beginning immediately after the tang. When placing a guard onto the blade, the crossbar block slides over the tang and then rests against the ricasso, preventing it from sliding further down the blade. The ricasso can extend from the crossbar block to the outer sweepings or guard shell (meaning the sharpened or more tapered edge of the blade begins immediately after the guard) or further down the length of the blade. The edges of the blade at the ricasso are square/flat. The sharpened part of the blade is generally what is referred to when speaking of the 'blade'. This part begins after the ricasso and is the part of the sword used for striking and defending. The edge of the blade is oriented with the crossbar of the guard and aligns with the knuckle of the hand when holding the sword so that the knuckles lead the edge. On a rapier there are two edges that you can identify when it is held: the true edge (on the same side as your knuckles) and the false edge (on the same side as the base of your thumb). The part of the blade opposite the tang and pommel that is used for penetrating the opponent. The lower half of the exposed rapier blade, generally used for defense. In Italian the Forte. The upper half of the exposed rapier blade, generally used for offense (cutting and thrusting). In Italian the Debole. The guard of the rapier is the part that protects the sword hand of the wielder. A counter weight at the base of the blade, just behind the guard. A spacer between the counter weight and handle. The part of the rapier that you hold. Handles can be made of wood, wood wrapped in wire, wood wrapped in leather, and some other materials. Some handles are shaped to provide comfortable grooves for your fingers or provide other handling or comfort characteristics. The crossbar or quillions are a rod that extend perpendicular to the blade, on either side, and are used for protecting the hand, binding blades, and deflecting the sword of the opponent. The rings and other rods that make up the guard and protect the hand. Sometimes referred to as the knuckle bow, the knuckle guard is a bar or bars of metal that extend down in front of the sword hand, protecting the knuckles. The knuckle guard can be used to identify the true edge of the sword. The cup or shell is a solid plate of dished metal that surrounds the hand, typically in place of the sweepings, but sometimes in combination on some guards. This page was last modified on 13 November 2008, at 15:21.